Methyl prednisolone, marketed by under the brand name Medrol, can help dogs suffering from various disorders, but the drug has the potential for causing some serious side effects. Medrol suppresses inflammation and works throughout an animal's entire body, so side effects involve both physical and behavioral issues. Vets prescribe methyl prednisolone for relief of various inflammatory conditions as well as for relief from allergic reactions. Medrol commonly serves in treatment of dogs diagnosed with autoimmune diseases, dermatitis, asthma, certain eye conditions, rheumatoid arthritis and colitis. If your dog is hit by a car or experiences some other type of extreme trauma, he might receive Medrol for brain and spinal cord inflammation. Dogs taking Medrol usually increase their water consumption and urinate more frequently. That's an expected side effect, but it's less of an issue with Medrol than with prednisolone. Other side effects include excessive panting, vomiting, diarrhea, weight gain and lethargy. Some dogs experience behavioral changes, including aggression. Given long-term, Medrol can cause Cushing's disease or hyperadrenocorticism. Symptoms of Cushing's disease include hair loss, thin skin and loss of muscle mass. Medrol can stunt growth in young canines. If your dog is scheduled for surgery or is battling a wound, Medrol can interfere with the healing process. Pregnant dogs should not receive Medrol, as administration during pregnancy could result in premature birth and puppy birth defects. Dogs with Cushing's disease should not receive Medrol. If your dog has been diagnosed with diabetes, glaucoma, congestive heart failure, high blood pressure, kidney or liver disease, your vet might choose another medication for treatment, or he may monitor your pet carefully. Dogs receiving any sort of nonsteroidal anti-inflammatory drugs should not take Medrol. 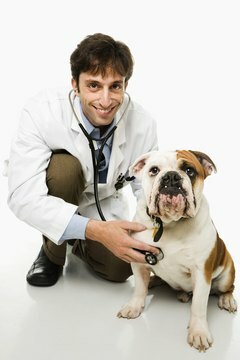 Tell your vet about any medications or supplements you give your pet.